I'm excited to be part of the Challenge again this year. As I continue to tap into "joy" as the motivation for my writing, I am also tracking the territories about which I tend to write (and sometimes intertwine). Current writing territories are teaching, family, friends, travel, working with a personal trainer, the quirks of being me. Today, my focus is me as a writer. It’s been quite some time since I’ve written so consistently, so until today, I hadn’t really thought much about my writing process. But, as I sat down to write this morning, it became very apparent to me that my process on the weekend is quite different than my weekday writing. Each Saturday and Sunday when I open my laptop, I first scan my desktop and look at its clutter. So many screenshots, images, and saved documents from the week! Time to organize them by trashing, putting in folders on the desktop, or saving to the Cloud. I also spend some time reading article ideas and blog posts that I have begun, but haven’t finished. I start to think and plan for what’s next for all of those. Today the answer was just putting them in a writing ideas folder to come back to when I am ready. One article idea really caught my attention this morning, so I envision tomorrow morning’s organization will include jotting down some more thinking around that topic. Then the collaborative part of my writing process begins. Instead of jumping right into my own writing, I begin to comment on others’ posts. I came to the realization that there is even a system for that. But on the weekend, I make a huge effort to get to those first two groups of people – Feedly and people who left comments – on both days. This is a great writing warm-up because it lets me peek into so many lives, and (I admit it!) sometimes even borrow ideas for slices. It is a perfect way to get my writing juices flowing. Once I have celebrated others, then it is time to choose one or two posts to write for myself. I make sure Facebook, email, and Twitter are closed – much less distraction! – and I begin to write. Do you have a process that looks different on the weekends? I’d love to hear about it! I don't - I write whenever I can and I always seem to want to. I comment first thing in the morning and then again in the evening. I capture my ideas all the time and I too have tons of seed pieces. I tend to always just start by thinking about what moves me in that moment. I often wind up writing or working on something completely different than what I planned. Weird? Love that you know your process --enjoy! Thinking about my own process. Thanks for the nudge. 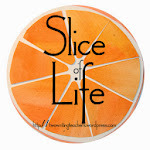 Now that I am writing each day with Slice of Life, I find myself catching ideas more often. The trick is writing/typing them down before I lose the idea. Interestingly, though, some of those turn into posts and some don't go anywhere. I have learned that some of those ideas just don't lift my writing to the level I want it to be. Thanks for making me think today. I enjoyed hearing your process, Karen & now that my schedule is different because I'm retired, some days are different than others. I prefer to write in the evenings, try hard to get ready for the next day, and "not" have to finish in the am. doesn't work for me. But I do start commenting in the am, like the old days of reading the newspaper! And I do check the headlines of several papers! Thank you so much for this post! I was inspired by this piece to write my own slice this morning. I was very worried today that I wouldn't have any ideas, so I was very relieved to feel the spark when I read your piece! I usually try to get up early enough every day of the week to have my process be just the same, weekday and weekend, but it doesn't always work. You are so organized, Karen. I'm kind of happy go lucky about writing time - I just go at it whenever I can, whatever day of the week it might be.